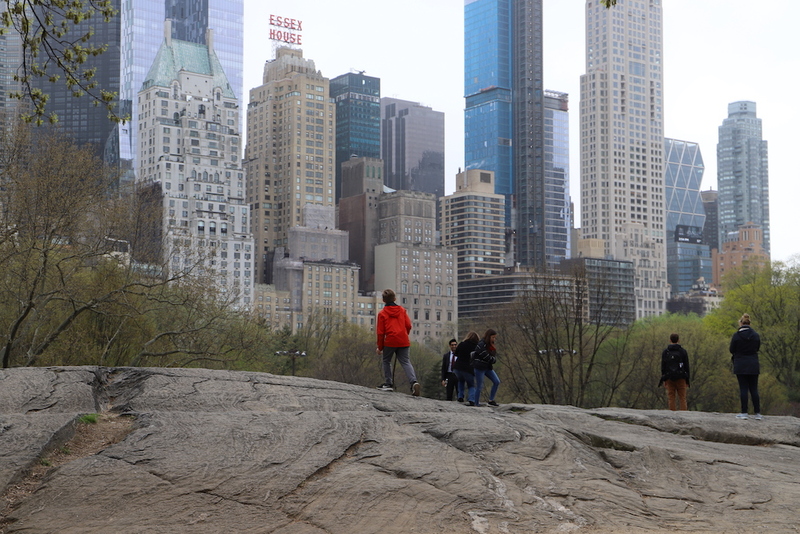 My son, Nicolas, loved climbing rocks in Central Park. My wife and I loved that it was an easily accessible respite from the city. This year for Spring Break, my family and I drove 2,200 miles from Chicago to visit family in Boston and New York City. Along the way we stopped in Cleveland, Harrisburg, New Haven and New Bedford, Massachusetts and spent the night in Buffalo and Pittsburgh. Visiting eight cities in eight days was an amazing opportunity to not only see how varied America really is, but also learn a bit about what cities are doing right and wrong. Here, in no particular order, are some of my observations from our trip. 1. Boston and NYC’s rapid transit has a much tighter grid, and seems to be much busier than Chicago’s, but Chicago’s system is cleaner, quieter and a better riding experience. 2. Every city, no matter what the size, has some kind of cool thing other cities should all be jealous of. 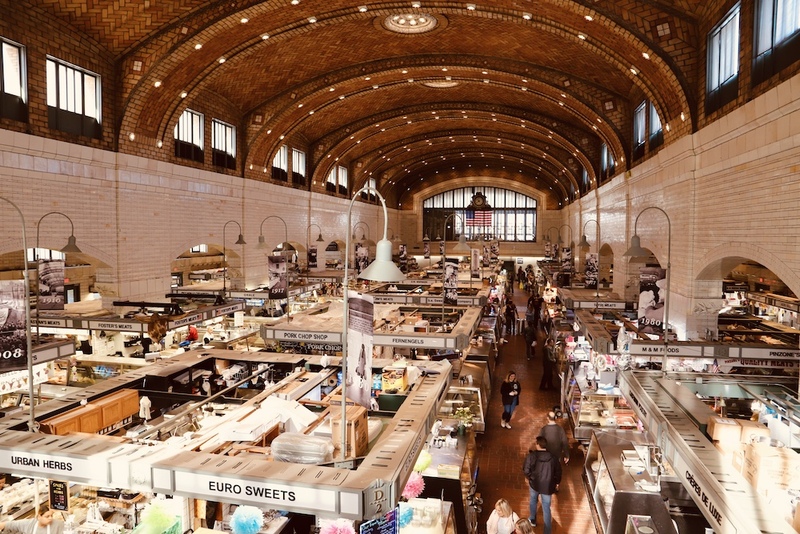 For Cleveland, it’s the West Side Market. Buffalo, it’s the stellar downtown architecture. New Haven, it’s an Italian community with a genuinely unique and excellent native pizza (and Yale too, I guess). Harrisburg, a terrific minor league ballpark right on the river. Pittsburgh, it’s a tight, bustling downtown with a vibrant restaurant scene that is unusual for many mid-sized cities. 3. The American landscape, is varied and beautiful. Just between Chicago, Boston and New York, we saw five very different landscapes that took our breaths away. The spaces between our cities are magnificent. 4. Rush hour traffic in Boston and NYC is horrific. 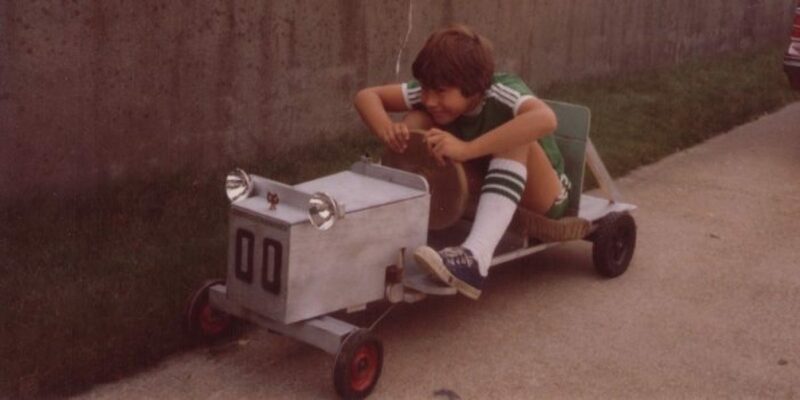 I will never complain about Chicago traffic again. 5. Most everything in NYC, especially Manhattan, is obscenely expensive. I can’t understand how any kind of middle class can possibly exist in Manhattan and most of Brooklyn. This is not a good development for the city. 6. Seafood on the East Coast is plentiful and relatively inexpensive. I’d forgotten this fact, even though I lived on the East Coast for twelve years. I miss it. 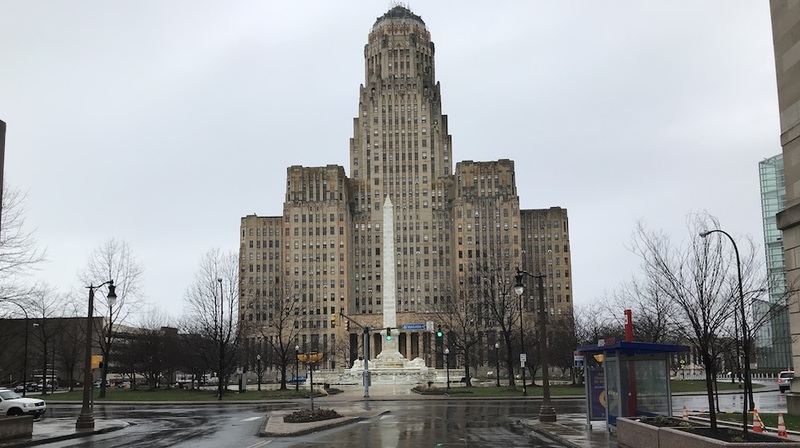 Buffalo’s City Hall. Completed in 1931, it is an art deco masterpiece covered with friezes. 7. We only spent a night and a rainy morning in Buffalo. I’d like to spend more time there. The city is absurdly inexpensive, and we stayed in a great hotel and had a spectacular meal at a French restaurant downtown. Maybe we hit the best parts, but I sense there’s more to the city. 8. Boston’s new Seaport district is a development triumph, but a failure of city planning, in my opinion. We visited the Institute of Contemporary Art (not worth a return, I think) and explored the Seaport area a bit. It is full of glassy buildings, trendy young people and pricey-looking restaurants. I suppose this is appealing to corporations and twenty-somethings looking to burn inflated salaries, but it lacks soul. I wonder how popular it will be in twenty years. 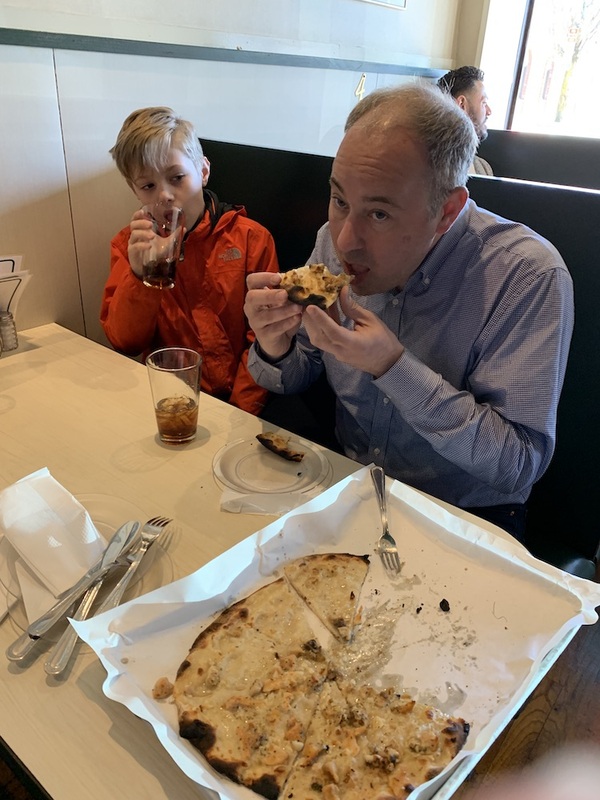 Me enjoying Franco Pepe’s white pizza, which covered with clams and garlic and with a crispy crust, was probably the best pizza I’ve ever had. Better than in Chicago. No lie. 9. Now that I’ve had New Haven-style pizza, I think it’s better than Chicago-style and Brooklyn-style. I know this is sacrilegious for me to say, considering my Chicago roots, but facts are facts. Get to Franco Pepe’s Apizza as soon as you can. 10. Coney Island is wonderful. It’s a good thing Chicago doesn’t have an amusement park I can get to by L, because if I lived in NYC, I’d hit Coney Island’s roller coasters at least once a month. So great. 11. We visited downtowns of Buffalo, Boston, Harrisburg, New Haven, New York and Pittsburgh. It doesn’t take much observation to see how dense downtowns – and really entire cities – are able to offer many more amenities. 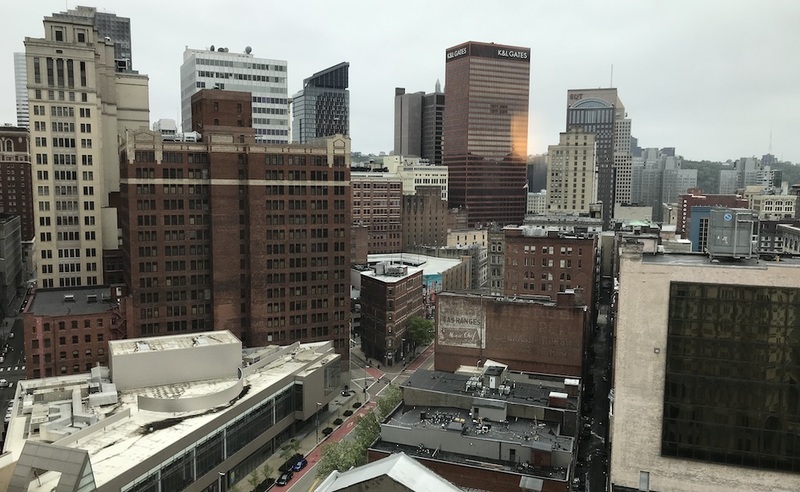 Buffalo and New Haven’s downtowns have large amounts of empty space, but Boston and Pittsburgh have downtowns hemmed in by either water or neighborhoods, enforcing density (NYC is a whole other category). These dense areas create virtuous circles of culture and commerce in ways obvious to any observer. I can’t understand why so many Americans fear density. It makes more things possible. 12. I lived in Harrisburg for three months in 1996 and hated it. Visiting last week for the first time since then, I was happy to see that it has improved somewhat, especially the historic neighborhood just north of the Capitol between Front and Third Streets. The city still has a long way to go, but I would no longer call it a “dump”, as I did twenty years ago. Downtown Pittsburgh is dense, busy and vibrant, even on Easter weekend, when we visited. 13. We did not have much time to explore Pittsburgh, but the downtown has visibly improved since I last visited fifteen years ago. Most of the empty lots have been in-filled, there’s a real restaurant scene, and on Easter Sunday, there were plenty of people wandering around a downtown that lacks residential buildings, which suggests to me that people find downtown worth driving to hang out. 14. Most on-the-road fast food is total garbage. I’ve come to adore Culver’s in the Midwest, and man, it’s a great go-to when you’re just looking for an O.K. lunch on the road. Also: Why the heck do so many toll road service plazas have Sbarro? It is so unbelievably bad. 15. American interstates are incredible. I drove from Paris to Madrid in 2002 and was stunned at how poor the roads in both France and Spain were – sometimes they were barely better than gravel with tiny signs you could miss in a blink. American interstates on the other hand are pristine, have excellent signage and easy to use on/off ramps. We Americans spend an incredible amount of money on our highways, an amazing subsidy for trucking and citizens with enough time and money to use the roads for long distance travel. The Cleveland West Side Market. Jammed with real vendors in a beautiful building. 16. Cleveland’s West Side Market is amazing. Noticing it on the map while driving through the city on I-90, we decided to get off the interstate to check it out and we couldn’t have made a better decision. This is not a tourist market – stocked with working butchers, bakers, fish sellers and produce stands, it is the kind of place regular people could go shopping on a regular basis. Oh! And the building is gorgeous. Every American city needs places like these. Shopping becomes a social experience and you get to meet the people who care about bringing you great food. 17. Boston is crawling with university students. While the city residential population is about 685,000, the city reported 152,000 students from its 35 colleges, universities, and community colleges in 2010. From past experience, I’ve noticed that Boston during the summer break has a completely different vibe than during the school year – it’s like the city is quieter and more relaxed. 18. I haven’t mentioned New Bedford’s incredible working harbor, the super cool Fraunces Tavern in Manhattan’s Battery, Boston’s North End, Buffalo’s great Pierce-Arrow Transportation Museum, Central Park, the tire shop in The Bronx that fixed a flat for $12 and so much more. Finally, if you have an opportunity to take an American driving trip like ours, I strongly recommend it. You’ll see so many great things. This happy dog sounds like a TIE Fighter. I really enjoyed the Towson Center’s Emily Bell just ripping apart all of news media’s sacred cows – on a podcast aimed at news media’s elite. For years I looked for one thing: A way to find the cheapest flights from my hometown to anywhere. But then I found Hitlist and all my dreams came true. American election night parties are a unique thing. If you’ve been a committed campaign volunteer or, worse yet, a member of the staff, the amount of tension and mental and physical exhaustion building up to the party can be overwhelming. Unlike any other effort, democratic elections are a totally zero-sum game, either you won it all, or lost it all. Maybe you can try again in a few years, but even with the benefit of past experience, you’re pretty much starting a brand new campaign all over again. So, when you get to that election night party where you find out if all your efforts were worthwhile – the polls are closed and there’s nothing to do but wait for the results – things start to happen. For one, just about everyone you met during the course of the campaign suddenly seems like your best buddy. Everyone is hugging. They could be smiling or crying depending on the expected outcome, but that’s irrelevant compared to the fact that everyone at this party IS NOW YOUR TRIBE. Tonight, you would fight a thousand samurai warriors with your bare hands for these people. Even the old guy volunteer that brought donuts every day. Especially that old guy. Except for the big parties in Washington, D.C., Most election night parties are decidedly low budget affairs. Union halls, Veterans of Foreign Wars halls, a cheap bar at the edge of town, or maybe a meeting room at the Holiday Inn. Big U.S. Senate or governor campaign often rent a fancy hotel ballroom, but it’s a cash bar with a DJ and certainly no appetizers. Probably the two most extravagant election night parties I’ve been to occured on the same night in 2004. For the Illinois Democratic Primary, a high school friend was the daughter of one candidate, Blair Hull. A wealthy man, his good government campaign fell apart after local media forced open his divorce files, revealing that he and his ex-wife had physical altercations. But determined to see things through, Hull campaigned hard until the last day. So, a friend and I decided to check out his election night party, even though he was guaranteed to lose. It was in a beautiful, high-end hotel ballroom in Chicago. Free drinks, shrimp cocktail and tasteful decorations. But the room was largely empty as a few volunteers and staff drank themselves into oblivion, waiting for the inevitable bad results to come in later that night. So we left. Down the street, at the Hyatt Regency, was the party for another guy running: Barack Obama. The Hyatt Regency, a convention hotel, has what seems like four or five basement levels. We went down all of them. Following escalators and a steady trail of people heading the same direction. Then, we reached a bottom floor, turned a corner and heard a raging crowd and thumping music down a dark hallway. We walked a bit, then pulled open some doors, and there we saw a thousand people crammed into a room for five hundred. No bar, no chairs. Just lots of people and a sound system blaring Motown. A stage was at the front, and we stood on tiptoe, craning our necks to see over the crowd. Then, only minutes after we arrived – Barack appeared! But this wasn’t the international rock star we know today. This was a guy who had just won an unbelievable, come-from-behind win in his first statewide election. He wasn’t even elected yet! This was just the primary election! He was skinnier, younger than today. Maybe more awkward. But he strode across the stage with a huge smile, pulling a woman that must have been his wife–Michelle did not campaign with him at first–and swung his arm up in a broad wave to us all. The room erupted. Total bedlam! These were people who had worked, really worked to get him elected. Illinois was still learning how to say “Barack”, but these people knew. They were the originals. The core believers. If it was belam before, now people were crying. Screaming. Laughing. The panoply of human emotion was entirely on display. Even though I was an interloper, new to the whole Obama thing, I couldn’t help but laugh and gush with excitement myself. Maybe-This-Was-A-Big-Deal! Mercifully, his speech was short. But when it was over, it seemed like everyone in the room – all one thousand of them – knew one another except for me and my friend. We stepped out, as the true believers began to really party for the night. Random things found for you on the Internets. Middling Industries is the digital home of Mike Fourcher, a mid-American. Click the buttons below to get more Mike and to contact him. Join the email list to receive weekly emails from Mike . Your personal information will never be shared.